The clock has graphics that turn with the hour hand displaying light blue, white clouds and mid day sun to help illustrate daytime and dark blue, stars and crescent moon at midnight for night-time. 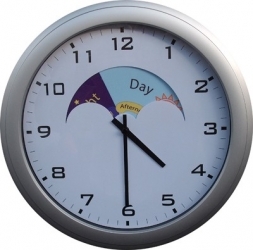 It also indicates with text morning, afternoon, evening and night-time. The hands are distinct from one an other. This avoids misinterpreting 12.20 for 4.00 as often happens.